This article is about the holiday. For the film of the same name, see Columbus Day (film). For the Pacific Northwest storm, see Columbus Day Storm of 1962. Columbus Day is a national holiday in many countries of the Americas and elsewhere which officially celebrates the anniversary of Christopher Columbus's arrival in the Americas on October 12, 1492 (Julian Calendar; it would have been October 21, 1492 on the Gregorian Proleptic Calendar, which extends the Gregorian Calendar to dates prior to its adoption in 1582). Christopher Columbus was an Italian explorer who set sail across the Atlantic Ocean in search of a faster route to the The Far East only to land at the New World. His first voyage to the New World on the Spanish ships the Santa María, Niña, and La Pinta took approximately three months. Columbus and his crew's arrival to the New World initiated the Columbian Exchange which introduced the transfer of plants, animals, culture, human populations, and technology between the new world and the old. Various countries in the Americas, Spain, Italy, various Little Italys around the world. The landing is celebrated as "Columbus Day" in the United States but the name varies on the international spectrum. In some Latin American countries, October 12 is known as "Día de la Raza" or (Day of the Race) but, for instance Peru, others know it as "Día del descubrimiento de America" (or "Day of the discovery of America"). Some countries such as Spain refer the holiday as "Día de la Hispanidad" and "Fiesta Nacional" where it is also the religious festivity of la Virgen del Pilar. Belize and Uruguay celebrate it as Día de las Américas (Day of the Americas). Argentina's former president Cristina Fernández de Kirchner officially adopted "Día del Respeto a la Diversidad Cultural" (Day of Respect for Cultural Diversity) November 3, 2010. "Giornata Nazionale di Cristoforo Colombo or Festa Nazionale di Cristoforo Colombo" is the formal name of Italy's celebration as well as in Little Italys around the world. Celebration of Christopher Columbus's voyage in the early United States is recorded from as early as 1792. The Tammany Society in New York City  (for whom it became an annual tradition) and the Massachusetts Historical Society in Boston celebrated the 300th anniversary of Columbus' landing in the New World. President Benjamin Harrison called upon the people of the United States to celebrate Columbus's landing in the New World on the 400th anniversary of the event. During the anniversary in 1892, teachers, preachers, poets and politicians used rituals to teach ideals of patriotism. These rituals took themes such as citizenship boundaries, the importance of loyalty to the nation, and the celebration of social progress. Many Italian-Americans observe Columbus Day as a celebration of their heritage, and the first such celebration was held in New York City on October 12, 1866. The day was first enshrined as a legal holiday in the United States through the lobbying of Angelo Noce, a first generation Italian, in Denver. The first statewide holiday was proclaimed by Colorado governor Jesse F. McDonald in 1905, and it was made a statutory holiday in 1907. In April 1934, as a result of lobbying by the Knights of Columbus and New York City Italian leader Generoso Pope, Congress and President Franklin Delano Roosevelt proclaimed October 12 be a federal holiday under the name Columbus Day. Since 1971 (Oct. 11), the holiday has been attributed to the second Monday in October, coincidentally exactly the same day as Thanksgiving in neighboring Canada since 1957. It is generally observed nowadays by banks, the bond market, the U.S. Postal Service, other federal agencies, most state government offices, many businesses, and most school districts. Some businesses and some stock exchanges remain open, and some states and municipalities abstain from observing the holiday. The traditional date of the holiday also adjoins the anniversary of the United States Navy (founded October 13, 1775), and thus both occasions are customarily observed by the Navy and the Marine Corps with either a 72- or 96-hour liberty period. Actual observance varies in different parts of the United States, ranging from large-scale parades and events to complete non-observance. Most states celebrate Columbus Day as an official state holiday, though many mark it as a "Day of Observance" or "Recognition" and at least four do not recognize it at all. Most states that celebrate Columbus Day will close state services, while others operate as normal. San Francisco claims the nation's oldest continuously existing celebration with the Italian-American community's annual Columbus Day Parade, which was established by Nicola Larco in 1868, while New York City boasts the largest, with over 35,000 marchers and one million viewers. As in the mainland United States, Columbus Day is a legal holiday in the U.S. territory of Puerto Rico. In the United States Virgin Islands, the day is celebrated as both Columbus Day and "Puerto Rico Friendship Day." Virginia also celebrates two legal holidays on the day, Columbus Day and Yorktown Victory Day, which honors the final victory at the Siege of Yorktown in the Revolutionary War. The celebration of Columbus Day in the United States began to decline at the end of the 20th century, although many Italian-Americans, and others, continue to champion it. The states of Florida, Hawaii, Alaska, Vermont, and South Dakota, do not recognize it and have each replaced it with celebrations of Indigenous People's Day (in Hawaii, Discoverers' Day, in South Dakota, Native American Day). Columbus Day also competes with Leif Erikson Day. A lack of recognition or a reduced level of observance for Columbus Day is not always due to concerns about honoring Native Americans. For example a community of predominantly Scandinavian descent may observe Leif Erikson Day instead. In the state of Oregon, Columbus Day is not an official holiday. Iowa and Nevada do not celebrate Columbus Day as an official holiday, but the states' respective governors are "authorized and requested" by statute to proclaim the day each year. Several states have removed the day as a paid holiday for state government workers, while still maintaining it—either as a day of recognition, or as a legal holiday for other purposes, including California and Texas. U.S. cities that officially eschew Columbus Day to celebrate Indigenous Peoples' Day, began with Berkeley, California in 1992 and, as of 2018, include Austin, Boise, Cincinnati, Denver, Los Angeles, Mankato, Minnesota, Portland, Oregon, San Francisco, Santa Fe, New Mexico, Seattle, St. Paul, Minnesota, Tacoma, and "dozens of others." Columbus, Ohio has chosen to honor veterans instead of Christopher Columbus, and removed Columbus Day as a city holiday. Various tribal governments in Oklahoma designate the day as Native American Day, or name it after their own tribe. Argentine government poster from 1947 including the concept of la Raza. The date Columbus arrived in the Americas is celebrated in some countries of Latin America. The most common name for the celebration in Spanish (including some Latin American communities in the United States) is the Día de la Raza ("day of the race" or the "day of the [Hispanic] people"), commemorating the first encounters of Europeans and the Native Americans. The day was first celebrated in Argentina in 1917, in Venezuela and Colombia in 1921, in Chile in 1922 and in Mexico it was first celebrated in 1928. The day was also celebrated under this title in Spain until 1957, when it was changed to the Día de la Hispanidad ("Hispanicity Day"), and in Venezuela it was celebrated under this title until 2002, when it was changed to the Día de la Resistencia Indígena (Day of Indigenous Resistance). Originally conceived of as a celebration of Hispanic influence in the Americas, as evidenced by the complementary celebrations in Spain and Latin America, Día de la Raza has come to be seen by nationalist activists throughout Latin America as a counter to Columbus Day; a celebration of the native races and cultures and their resistance to the arrival of Europeans in the Americas. In the United States, Día de la Raza has served as a time of mobilization for pan-ethnic Latino activists, particularly since the 1960s. Since then, La Raza has served as a periodic rallying cry for Hispanic activists. The first Hispanic March on Washington occurred on Columbus Day in 1996. The name is still used by the largest Hispanic social justice organization in the nation, the National Council of La Raza. The Day of the Race was established in Argentina in 1916 by a decree of President Hipólito Yrigoyen. The name was changed to "Day of Respect of Cultural Diversity" by a Decree of Necessity and Urgency 1584/2010 issued by President Cristina Kirchner. Under the likely influence of the Venezuelan government, the statue of Columbus was removed from its original position near the Casa Rosada and replaced by one of Juana Azurduy. Colombia, the only country in the world with a name originated from Columbus himself, celebrates El día de la Raza y de la Hispanidad and is taken as an opportunity to celebrate the encounter of "the two worlds" and to reflect on the richness that the racial diversity has brought to the culture. In Perú it is known as "día del descubrimiento de America" ("Day of the discovery of America"). Statue-less plinth in Caracas in 2006. A statue by the 19th century sculptor De la Cova, which formerly occupied the plinth, was knocked down by activists after a "public trial" during the celebrations of the newly instituted "Day of the Indigenous Resistance" (October 12) in 2004. Between 1921 and 2002, Venezuela celebrated Día de la Raza along with many other Latin American nations. The original holiday was officially established in 1921 under President Juan Vicente Gómez. In 2002, under President Hugo Chávez, the holiday was changed to Día de la Resistencia Indígena (Day of Indigenous Resistance) to commemorate the Indigenous peoples' resistance to European settlement. On October 12, 2004, a crowd of pro-government activists toppled a statue of Christopher Columbus in Caracas. The activists also sprayed allusive graffiti over its pedestal. The Walk where the statue had stood was renamed in 2008 "Indigenous Resistance Walk". Later a statue of an indigenous leader, Guaicaipuro, was erected on the plinth. On September 21, 1994, Costa Rica changed the official holiday from Día de la Raza to Día del Encuentro de las Culturas (Day of the Encounter of Cultures) to recognize the mix of European, Native American (autochthonous populations), African and Asian cultures that constitute modern Costa Rican (and Latin American) culture and ethnicity. In accordance to the Costa Rican labor law, the holiday is observed on October 12. However, should this date coincide with a Tuesday, Wednesday, Thursday or Friday, the employer shall agree that said holiday be postponed to the following Monday. In Brazil, Columbus Day is not celebrated. Instead, the country celebrates the arrival on the coast of present-day Brazil of the fleet led by Portuguese explorer Pedro Álvares Cabral on April 22, 1500. This date is known in Brazil as "O Descobrimento do Brasil" (The Discovery of Brazil). The date began to be celebrated after the country's independence from Portugal, when Brazilian Emperor Pedro II instituted the date as part of a plan to foster a sense of nationalism among Brazil's diverse citizenry—giving them a common identity and history as residents of a unique Portuguese-speaking empire surrounded by Hispanic Republics of the Americas. The Discovery of Brazil was originally celebrated on May 3, but scholars in the nineteen century found definitive evidence proving April 22 to be the actual date of the arrival of Cabral's fleet on South American shores. In 2000, the government of Brazil used the date to celebrate 500 years of the existence of the country. The festivities, however, were met with protests by indigenous peoples who claimed it marked 500 years of genocide of indigenous Brazilians. However, since 1980 October 12 is a national holiday, the feast of the patron saint of the country, Our Lady of Aparecida. Only a handful of Caribbean countries still observe holidays related to Columbus Day. In Belize, October 12 is celebrated as Day of the Americas or Pan American Day. In the Bahamas, it was formerly known as Discovery Day, until 2001 when it was replaced by National Heroes Day. In 1937, Cuban President Federico Laredo Brú (1936–1940) spoke to the nation and countries of America in Cuba on 12 October commemorating Christopher Columbus's voyage to the New World. Federico Laredo Brú spoke about Columbus' impact on the land and the future of its settlement. He ended his speech with venerating Christopher Columbus' efforts to colonize and establish settlements along the new front and the pride of ones nation. He added "Por mi raza hablo mi espiritu," which translates to "For my race my spirit called," in order to support the political infrastructure at the time. December 1937, Cuban president Federico Laredo Brú and Dominican Republic president Rafael Trujillo ordered a crew of aviators to travel through Latin America collecting funds from large capital cities for a monumental light house in the Dominican Republic. The exploration Escuadrilla Binacional Pro Faro de Colón was inspired by Columbus' odyssey to the Americas where three of the four planes were named after the vessels that journeyed across the North Atlantic Ocean (Santa María, Niña, and La Pinta). The expedition consisted of three Stinson Reliant SR-9 borrowed from the Cuban Air Force and a Curtiss Wright CW-19R from the Dominican military aviation named "Colombo" after Columbus. On December 15, after visiting a majority of South America, their destination in Lima, Peru was prolonagted due to an unexpected sandstorm locally knows as Paracas. Pilots of the Colon and La Pinta were forced to land in the city of Pisco however La Nina disappeared in the storm. The Santa Maria was the only plane to reach the Peruvian Capital as planned, landing at Las Palmas on the day of the storm. After extensive searching rescue La Nina radioed from Lima announcing their whereabouts after their radio was damaged in the storm. The aircraft restrategized in Las Palmas and on December 29 their expedition took off from El Techo airport in Bogotá en route to El Guabito airport in Cali. Later that day the crew flew into an unexpected storm with minimal visibility and poor navigation flying over the Valley of Cauca. La Nina, La Pinta and the Santa Maria flew straight into high mountains crashing to their deaths. Colon, unaware of the other aircraft flew over the storm and safely made it to Panama City. The CW-19R Colon is still preserved today as remembrance of the bravery of the crew and Christopher Columbus' odyssey. The Columbus Lighthouse stands today in the Dominican Republic. Since the 18th century, many Italian communities in the Americas have observed the Discovery of the New World as a celebration of their heritage; Christopher Columbus (whose original, Italian name is "Cristoforo Colombo") was an Italian explorer, citizen of the Republic of Genoa. In Italy, Columbus Day has been officially celebrated since 2004. It is officially named Giornata nazionale di Cristoforo Colombo. The "Lega Navale Italiana" has created a Regata di Colombo as a celebration of the Columbus achievement. Italians have celebrated their "Cristoforo Colombo" naming after him many civilian and military ships, like the ocean liner SS Cristoforo Colombo. Since 1987, Spain has celebrated the anniversary of Columbus's arrival in the Americas as its Fiesta Nacional or "National Day". Previously Spain had celebrated the day as Día de la Hispanidad, emphasizing Spain's ties with Hispanidad, the international Hispanic community. In 1981 a royal decree established the Día de la Hispanidad as a national holiday. However, in 1987 the name was changed to Fiesta Nacional, and October 12 became one of two national celebrations, along with Constitution Day on December 6. Spain's "national day" had moved around several times during the various regime changes of the 20th century; establishing it on the day of the international Columbus celebration was part of a compromise between conservatives, who wanted to emphasize the status of the monarchy and Spain's history, and Republicans, who wanted to commemorate Spain's burgeoning democracy with an official holiday. Since 2000, October 12 has also been Spain's Day of the Armed Forces, celebrated each year with a military parade in Madrid. Other than this, however, the holiday is not widely or enthusiastically celebrated in Spain. There are no large-scale patriotic parades, marches or other events, but shops and businesses are closed as with other bank holidays. The observation is generally overshadowed by the feast day of Our Lady of the Pillar (Fiestas del Pilar). This holiday was declared a religious feast day throughout the Spanish Empire in 1730. In recent years, celebration of the holiday has faced some opposition from various organizations. Engraving by Theodor de Bry depicting the controversial account by Bartolomé de las Casas regarding the Brevísima relación de la destrucción de las Indias, 1552. De Bry's works are characteristic of the anti-Spanish propaganda that originated as a result of the Eighty Years' War, known as the Black Legend. 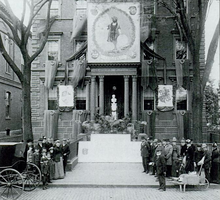 Opposition to Columbus Day dates back to at least the 19th century, when anti-immigrant nativists (see Know Nothings) sought to eliminate its celebration because of its association with immigrants from the Catholic countries of Ireland and Italy, and the American Catholic fraternal organization, the Knights of Columbus. Some anti-Catholics, notably including the Ku Klux Klan and the Women of the Ku Klux Klan, opposed celebrations of Columbus or monuments about him because they thought that it increased Catholic influence in the United States, which was largely a Protestant country. By far the more common opposition today, decrying both Columbus' and other Europeans' actions against the indigenous populations of the Americas, did not gain much traction until the latter half of the 20th century. This opposition was led by Native Americans and expanded upon by left-wing political parties, though it has become more mainstream. Surveys conducted in 2013 and 2015 found 26% to 38% of American adults not in favor of celebrating Columbus Day. There are many interrelated strands of criticism. One refers primarily to the treatment of the indigenous populations during the European colonization of the Americas which followed Columbus's discovery. Some groups, such as the American Indian Movement, have argued that the ongoing actions and injustices against Native Americans are masked by Columbus myths and celebrations. American anthropologist Jack Weatherford says that on Columbus Day, Americans celebrate the greatest waves of genocide of the American Indians known in history. A second strain of criticism of Columbus Day focuses on the character of Columbus himself. In time for the 2004 observation of the day, the final volume of a compendium of Columbus-era documents was published by the University of California, Los Angeles's Medieval and Renaissance Center. It stated that Columbus, while a brilliant mariner, exploited and enslaved the indigenous population. Spelman College historian Howard Zinn described some of the details of how Columbus personally ordered the enslavement and mutilation of the native Arawak people in a bid to repay his investors. Journalist and media critic Norman Solomon reflects, in Columbus Day: A Clash of Myth and History, that many people choose to hold on to the myths surrounding Columbus. He quotes from the logbook Columbus's initial description of the American Indians: "They do not bear arms, and do not know them, for I showed them a sword, they took it by the edge and cut themselves out of ignorance.... They would make fine servants.... With 50 men we could subjugate them all and make them do whatever we want." Solomon states that the most important contemporary documentary evidence is the multi-volume History of the Indies by the Catholic priest Bartolomé de las Casas, who observed the region where Columbus was governor. In contrast to "the myth," Solomon quotes Las Casas, who describes Spaniards driven by "insatiable greed"—"killing, terrorizing, afflicting, and torturing the native peoples" with "the strangest and most varied new methods of cruelty" and how systematic violence was aimed at preventing "[American] Indians from daring to think of themselves as human beings." The Spaniards "thought nothing of knifing [American] Indians by tens and twenties and of cutting slices off them to test the sharpness of their blades," wrote Las Casas. "My eyes have seen these acts so foreign to human nature, and now I tremble as I write." In the summer of 1990, 350 representatives from American Indian groups from all over the hemisphere, met in Quito, Ecuador, at the first Intercontinental Gathering of Indigenous People in the Americas, to mobilize against the 500th anniversary (quin-centennial) celebration of Columbus Day planned for 1992. The following summer, in Davis, California, more than a hundred Native Americans gathered for a follow-up meeting to the Quito conference. They declared October 12, 1992 to be "International Day of Solidarity with Indigenous People." ^ a b "Governo Italiano – Dipartimento per il Cerimoniale dello Stato". Governo.it. November 23, 2012. Archived from the original on May 22, 2013. Retrieved January 30, 2015. ^ "Today in History – October 12". The Library of Congress. Archived from the original on January 18, 2018. Retrieved January 17, 2018. ^ Smith-Rosenberg, Carroll (December 1, 2012). This Violent Empire: The Birth of an American National Identity. UNC Press Books. ISBN 9780807895917. ^ Strausbaugh, John (August 2, 2016). City of Sedition: The History of New York City during the Civil War. Grand Central Publishing. ISBN 9781455584192. ^ "Massachusetts Historical Society: Search the MHS Website". www.masshist.org. Retrieved December 7, 2018. ^ "Tammany Hall | American political history". Encyclopedia Britannica. Retrieved December 7, 2018. ^ "Proclamation on the 400th Anniversary of the Discovery of America by Columbus". www.whatsoproudlywehail.org. Retrieved December 7, 2018. ^ a b Kubal, Timothy. 2008. Cultural Movements and Collective Memory: Christopher Columbus and the Rewriting of the National Origin Myth. New York: Palgrave Macmillan. ^ Connell, William J. (2010). "What Columbus Day Really Means". The American Scholar. ^ Appelbaum, Yoni (October 8, 2012). "How Columbus Day Fell Victim to Its Own Success". The Atlantic. Archived from the original on April 23, 2013. Retrieved April 23, 2013. ^ "Día de la Raza – Viva Cuernavaca". universaldomainexchange.com. Retrieved December 2, 2018. ^ Noce, Angelo (1910). Columbus Day in Colorado: Angelo Noce ... Angelo Noce, printer. ^ "Yuma Pioneer September 15, 1905 — Colorado Historic Newspapers Collection". www.coloradohistoricnewspapers.org. Retrieved December 7, 2018. ^ United States House of Representatives (April 30, 1934). "36 USC 107, ch. 184, 48 Stat. 657". United States Code. Office of the Law Revision Counsel. Archived from the original (Text) on October 19, 2012. Retrieved October 19, 2012. ^ American Memory (October 6, 2010). "Today in History: October 12". Today in History. Library of Congress (National Digital Library). Archived from the original on October 19, 2012. Retrieved October 19, 2012. ^ Russell, Judy G. (October 9, 2018). "Columbus Day quiz answer". The Legal Genealogist. Retrieved December 7, 2018. ^ "LBJ Signs Bill to Set Up Five 3-Day Holidays". Sarasota Herald-Tribune. via Google News. Associated Press. June 29, 1968. The bill in question became the Uniform Monday Holiday Act. ^ Dougherty, Conor; Reddy, Sudeep (October 10, 2009). "Is Columbus Day Sailing Off the Calendar?". The Wall Street Journal. Archived from the original on August 21, 2017. ^ Gore, Leada (October 12, 2015). "Columbus Day 2015: What's Closed, What's Open on Monday, Oct. 12?". al.com. Alabama Media Group. Archived from the original on October 7, 2016. Retrieved October 7, 2016. ^ "sfcolumbusday.org". sfcolumbusday.org. Archived from the original on September 26, 2011. Retrieved October 12, 2011. ^ "Columbus Citizens Foundation". Columbuscitizensfd.org. Archived from the original on January 28, 2011. Retrieved October 12, 2011. ^ "Manhattan Style 'The Annual Columbus Day Parade'". Manhattanstyle.com. Archived from the original on January 21, 2012. Retrieved October 12, 2011. ^ "PR Newswire 'Performers, Bands, and Red, White and Green on Fifth Avenue in NYC Columbus Day Parade'". New York: Prnewswire.com. Archived from the original on March 10, 2012. Retrieved October 12, 2011. ^ NextPage – LivePublish. "Title 1 Virgin Islands Code Section 171". Michie.com. Archived from the original on October 7, 2011. Retrieved October 12, 2011. ^ "LIS > Code of Virginia > 2.2-3300". Leg1.state.va.us. Archived from the original on January 16, 2009. Retrieved October 12, 2008. ^ a b O'Neil, Luke (October 8, 2018). "Goodbye, Columbus: holiday in decline as brutal legacy re-evaluated". The Guardian. ^ a b Yan, Holly (October 8, 2018). "Across the US, more cities ditch Columbus Day to honor those who really discovered America". CNN. ^ "Florida holidays". Retrieved October 5, 2018. ^ James, Taylor. "Hawaii celebrates the discoverer's day that commemorates the Polynesian discovery". Retrieved August 8, 2018. ^ "Hawaii Revised Statutes, Section 8-1.5". Hawaii.gov. Retrieved July 12, 2009. ^ "Alaska Statutes: AS 44.12.010. Legal Holidays". Touchngo.com. Archived from the original on September 30, 2011. Retrieved October 12, 2011. ^ Evans, Brad (October 7, 2016). "Vermont ditches Columbus Day for Indigenous Peoples' Day". mynbc5.com. Archived from the original on October 11, 2016. ^ "In South Dakota it's Native American Day". Retrieved October 23, 2018. ^ Kolodny, Annette (2012). "The Challenge to Columbus". In Search of First Contact: The Vikings of Vinland, the Peoples of the Dawnland, and the Anglo-American Anxiety of Discovery. Durham, North Carolina: Duke University Press. p. 231. ISBN 9780822352860. ^ "State of Oregon: Department of Administrative Services – Calendar". www.oregon.gov. Retrieved November 28, 2018. Iowa proclamation: "1C.5 Columbus Day". Iowa Code. Iowa Legislature. 2011. Archived from the original on January 27, 2013. Retrieved October 8, 2012. Nevada proclamation: Nevada Revised Statues Chapter 236 Archived October 15, 2011, at the Wayback Machine, section 236.025 "Columbus Day"
^ "California Government Code, Section 6700". Archived from the original on September 29, 2011. Retrieved January 19, 2011. ^ a b Dougherty, Conor; Reddy, Sudeep (October 10, 2009). "Is Columbus Day Sailing Off the Calendar?". Wall Street Journal. Archived from the original on January 6, 2015. Retrieved October 8, 2012. ^ Ortiz, Joe (February 4, 2010). "Schwarzenegger's Dropping Two State Holidays is Legal, California judge rules". The Sacramento Bee. Mcclatchydc.com. Archived from the original on September 13, 2012. Retrieved October 8, 2012. ^ "Texas Government Code § 662.044. Columbus Day". Retrieved October 12, 2015. ^ "Columbus Day in the United States". www.timeanddate.com. Archived from the original on September 9, 2017. Retrieved April 29, 2018. ^ Paddock, Richard C. (January 13, 2008). "UC Berkeley's bones of contention". Los Angeles Times. Archived from the original on July 7, 2011. ^ "Austin City Council renames Columbus Day to Indigenous Peoples Day". Retrieved October 12, 2017. ^ "What Christopher Columbus achieved was momentous. He deserves a holiday". Los Angeles Times. September 3, 2017. ISSN 0458-3035. Archived from the original on October 12, 2017. Retrieved October 12, 2017. ^ "Cambridge City Council Meeting – June 6, 2016 Agenda". rwinters.com. Archived from the original on June 13, 2016. Retrieved June 8, 2016. ^ "News: UW Group Offers Alternative to Columbus". The Badger Herald. Archived from the original on July 7, 2011. Retrieved October 12, 2011. ^ Sattin, Brad. "Mpls. City Council Passes Indigenous Peoples Day Resolution". KSTP/ABC-5 Eyewitness News. Archived from the original on October 10, 2014. Retrieved October 8, 2014. ^ "Columbus Day in Seattle no Longer: Now Indigenous Peoples' Day". October 6, 2014. Archived from the original on October 9, 2014. Retrieved October 6, 2014. ^ "Columbus Day changed to Indigenous People's Day in Vermont and city of Phoenix". cbsnews.com. Archived from the original on October 11, 2016. ^ "Columbus Day designated as Indigenous Peoples Day in Salt Lake City". fox13now.com. October 4, 2017. Archived from the original on March 15, 2018. Retrieved April 29, 2018. ^ Adcock, Clifton (October 13, 2008). "Holiday Not Celebrated by Tribes: American Indians See Columbus Day As a Reminder of Harsh Treatment Ages Ago". Tulsa World. ^ "3rd Annual Dia de la Raza Celebration". Archived from the original on April 15, 2012. Retrieved September 13, 2011. ^ "Derriban la Estatua de Cristóbal Colón en Caracas" (in Spanish). Iblnews.com. October 13, 2004. Archived from the original on April 14, 2008. ^ a b García Marco, Daniel (October 12, 2016). "¿Dónde está la estatua de Cristóbal Colón que fue juzgada, condenada y colgada el 12 de octubre de 2004 en Caracas?" (in Spanish). BBC Mundo. Retrieved April 15, 2019. ^ "Ley del Día de las Culturas" (PDF) (in Spanish). Mep.go.cr. Archived from the original (PDF) on April 15, 2012. ^ Schwarcz, Lilia Moritz (1998). As barbas do Imperador: D. Pedro II, um monarca nos trópicos (in Portuguese) (2nd ed.). São Paulo: Companhia das Letras. ISBN 978-85-7164-837-1. ^ "22 de abril: Nem sempre se comemorou o descobrimento neste dia" (in Portuguese). Uol.com.br. April 12, 2013. Archived from the original on October 16, 2017. ^ "500 Years Later, Brazil Looks Its Past in the Face". nytimes.com. April 25, 2000. Archived from the original on October 16, 2017. ^ "Festas e gafes nos 500 anos do Brasil" (in Portuguese). Globo.com.br. July 30, 2013. Archived from the original on October 16, 2017. ^ "San Pedro to Celebrate Belize's Rich Culture on Pan-American Day". The San Pedro Sun. October 7, 2013. Archived from the original on December 20, 2013. Retrieved October 8, 2013. ^ "Belize celebrates Pan American Day". Breaking Belize News. October 10, 2016. Archived from the original on October 11, 2016. Retrieved October 12, 2016. ^ "Holidays Act (Chapter 289)" (PDF). Laws of Belize. Government of Belize. 2000. Archived (PDF) from the original on March 10, 2015. Retrieved October 8, 2013. ^ Laredo Bru, Federico (1937). Dia de la Raza. Cuba: Sociedad Colombiana Panamericana. pp. 14–16. ^ "Escuadrilla Pro Faro de Colón in Peru (English)". Alas Andinas (in Spanish). June 6, 2018. Retrieved December 8, 2018. ^ Charles Speroni, "The Development of the Columbus Day Pageant of San Francisco," Western Folklore, Vol. 7, No. 4 (Oct. 1948), pp. 325–335.U.S. State Department, Bureau of International Information Programs. ^ "Regata della "Giornata Nazionale di Cristoforo Colombo"". Lega Navale Italiana. Archived from the original on April 14, 2015. ^ a b Prakke, L.; C. A. J. M. Kortmann; J. C. E. van den Brandhof (2004). Constitutional Law of 15 EU Member States. Kluwer. p. 748. ISBN 978-90-13-01255-2. ^ Hareng, Kate (October 10, 2017). "Dia de la Hispanidad – Spain Closed". P-O Life. ^ a b Kubap, Timothy (2008). Cultural movements and collective memory: Christopher Columbus and the rewriting of the national origin myth. Macmillan. pp. 33–38. ISBN 978-1-4039-7577-5. ^ "Why Do We Still Celebrate Columbus Day?". Liberal America. October 12, 2013. Archived from the original on October 1, 2016. Retrieved September 28, 2016. ^ "Why do Liberals Hate Columbus Day?". Death and Taxes. Archived from the original on October 7, 2016. Retrieved September 28, 2016. ^ "Indigenous People's Opposition to Celebration and Glorification of Colonial Pirate Christopher Columbus". Archived from the original on October 5, 2012. Retrieved October 7, 2012. ^ "History.com: Columbus Day Alternatives". Archived from the original on September 30, 2012. Retrieved October 7, 2012. ^ "Columbus Day: A Celebration of Heroism, Patriotism, and Italian and Latino Pride". New Boston Post. Archived from the original on October 3, 2016. Retrieved September 21, 2016. ^ Holley, Peter. "More Cities Celebrating 'Indigenous Peoples Day' Amid Effort to Abolish Columbus Day". The Washington Post. Archived from the original on September 23, 2016. Retrieved September 21, 2016. ^ "58% Think America Should Still Honor Christopher Columbus". Rasmussen Reports. Archived from the original on September 27, 2016. Retrieved September 21, 2016. ^ Edwards-Levy, Ariel (October 12, 2015). "Americans Are Split Over Whether Columbus Deserves A Holiday". The Huffington Post. Archived from the original on October 7, 2016. Retrieved September 21, 2016. ^ Weatherford, Jack. "Examining the Reputation of Christopher Columbus". hartford-hwp.com. Baltimore Evening Sun, reprinted by Clergy and Laity Concerned. Archived from the original on October 20, 2016. Retrieved October 7, 2016. ^ UC Newsroom (October 6, 2004). "'Repertorium Columbianum' Makes Landfall". Archived from the original on January 16, 2013. ^ Zinn, Howard (1980). "A People's History of the United States". Archived from the original on September 3, 2014. ^ Solomon, Norman (October 1995). "Columbus Day: A Clash of Myth and History". Media Beat. Archived from the original on October 25, 2009. ^ A Faithful Response to the 500th Anniversary of the Arrival of Christopher Columbus in A Resolution of the National Council of the Churches of Christ in the USA, paragraph 1. Wikimedia Commons has media related to Columbus Day.